What is the Gap Music? Almost fill those annoying gaps between songs music and the other giving the possibility to KJ / Entertainer, musician, or to prepare or present the next track while maintaining a pleasant and useful musical presence. There are many ways to use it (you can check it by reading the next specification) and its elasticity allows it to support any kind of performance, it's Karaoke, Live Music, Dance Group, etc.. Try it and see how it changes your entire show! By clicking the button referred to in paragraph (1) we enable the Video / External Monitor. The MG can also be used without the use of 2 ° video but as we will see with some limited functions. We prepare a play list ( see FAQ ). It 'can also load a playlist already set up (eg a ladder or Pianobar Dance Group), in this case, just choose from the dropdown menu at the top. 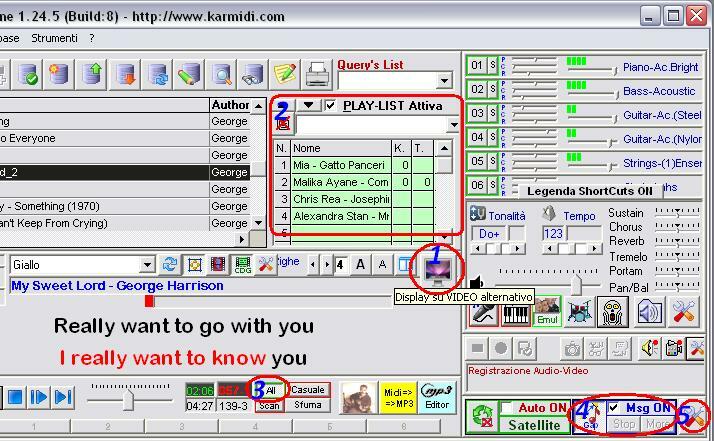 When using the SATELLITE the playlist is automatically populated and managed by the system and then you do not make any kind of intervention. With us is that the Music-enabled by pressing the Gap in paragraph (4). In that same area is possible or not to display messages during the MG and using the buttons Stop / More terminate or extend the respective period of time prepared. The key referred to in paragraph (5) serves to set the options that are explained below. In paragraph (1) you can choose the length in seconds of auto-Music Gap up to a maximum of 65. "This time can be modified interactively during the MS with the buttons Stop / More. Stop the MS ends and begins to fade, More lengthens the period of another period as set in the parameters, what if a course is a review by the KJ who need additional time, then you can stop at any time with "Stop"
In paragraph (2) you can choose the time of "nuance" (Fade Out) of the MG. Same song to play - It is advisable to use it for karaoke singers to allow time to pass the microphone and take a stand, or comments of the singer or KJ. It also helps the less experienced to "eavesdrop" before the song itself. During the group dances by the time all'entertainer for comments and to provide any figures to start. Randomly between songs in a folder - run any song at random from those contained in a specific folder. In the same folder you will also prepare TXT files that contain messages to be displayed during the MG. Warning! We speak of "songs" but in practice can be any audio or video media item. Then, midi, kar, mp3 or video advertising or promotional! In the case of video will not be displayed messages. In the case of messages from SATELLITE video on demand will be excluded from the randomness in order to prioritize messages. In paragraph (4) you can select the volume level during the MG with a percentage increase or decrease. Basically, once loaded the playlist, and with the parameters set in the right way the program can do everything by himself without any operative intervention. But as you saw it you can always willing to intervene on the controls for adjusting the service to the need for quotas. Here are two examples of display next to the big screen. The first refers to an advertisement the past during the "Music-Gap" between a song and the other, the second is during a karaoke song. Appears at the top in both the current song and the next to give the possibility to prepare for the next user. 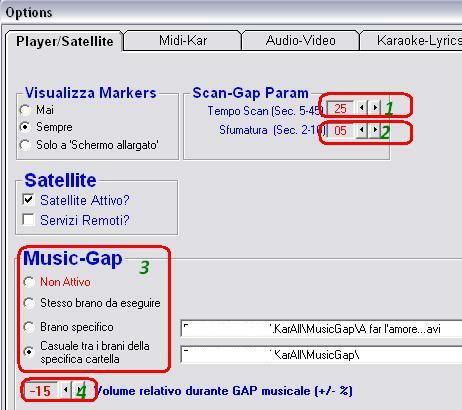 Recall that in the Music-Gap can also be displayed dedications specifically requested by the customer through the system SATELLITE .